Los Angeles Startup SINKBOSS® to Launch Invention for Washing and Drying a Baby’s Kitchenware at ABC Expo in Las Vegas October 17th-19th. Utility patent protected invention provides a portable, sanitary, and space-saving solution for washing and drying a baby’s kitchenware while at home or on the road. Sinkboss® LLC, a company that is revolutionizing the baby travel products industry, will launch its signature product at ABC Expo in Las Vegas on October 17th-19th. This portable, all-in-one device allows families to wash and dry baby bottles and other kitchenware while space is limited or away from home. 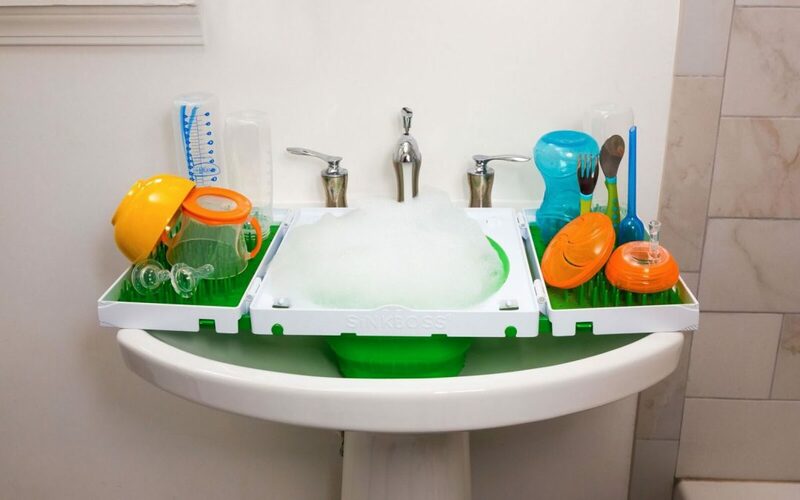 This plastic and silicon device is a compact washing rack, drying rack, and features several space saving solutions so that a baby’s kitchenware can stay organized and be placed out of the way. Founder and CEO Niloufar Gabbay is a licensed Physician Assistant and mother to 3 young kids. The idea for Sinkboss came from the inventor’s own personal experience. “I have always found it to be frustrating and difficult to wash my baby’s bottles in a hotel bathroom sink basin and then spread out all the pieces on a hotel hand towel on the countertop while drying.” She continued to explain the evening in which the concept for Sinkboss came to mind. In doing so, she explained that the hotel bathroom that she was cleaning baby bottles didn’t have a countertop to place the bottles to dry, and she found herself drying her childrens’ bottles and sippy cups on top of the toilet! Gabbay knew that she wasn’t the only parent facing these challenges. When the utility patent was issued in a record-breaking 3 months time, she knew she was up to something, and has since refocused her professional life to bring Sinkboss to market. Sinkboss is currently in production and expected to be commercially available September 2017. Direct to consumer as well as wholesale pre-orders are currently being taken through the Sinkboss website. Sinkboss will also be on demonstration at Big City Moms Biggest Family Shower Ever in Los Angeles on August 5th and MommyCon in Orange County on August 12th. People interested in seeing the Sinkboss product may call 818-489-7207 to book an appointment or email sinkbossbaby@gmail.com.